Lily Queen, a joint composition of Scott Joplin and Arthur Marshall, is the sole collaboration between the two after Swipesy in 1900. It’s believed to have been written about 1905, probably no later, and is an elegant piece with clear touches of both composers. (Even though Marshall told music historian Rudi Blesh that he wrote the entire piece, there are indications of Joplin’s touch as well.) Since Lily Queen was published in New York when Marshall was away in Chicago, it’s also likely that Joplin was the one who submitted it for publication. The opening section Lily Queen is chordal in character and stately in pace, with no tricky syncopations such as appear in so many of Joplin’s rags. Sources say the final section of the piece is where Marshall’s touch is truly distinctive: it has the character of banjo playing, a musical element that Joplin would pick up and use later in Wall Street Rag. Interestingly enough, the title—and the accompanying printed cover of the original—seem to imply a reference to a woman (the cover of the sheet music shows a woman’s face, surrounded by lily petals). However, it’s probably more likely that Lily Queen wasn’t named after a person so much as “she” may have been named after a riverboat! Many riverboats had a “royal” designation such as this; thus, the possibility that Lily Queen was a boat, rather than any particular woman, isn’t as far-fetched as it might seem. 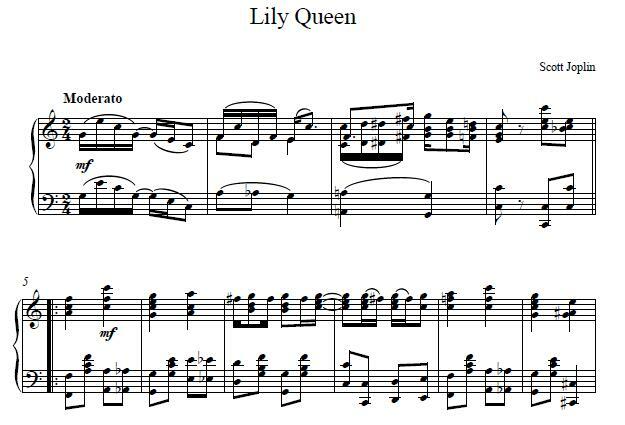 When you play Lily Queen, you might even imagine a leisurely riverboat trip, with the sound of gently plucked strings as counterpoint to the lapping of the water. Keep that image in mind, and you’ll play this piece at a steady, flowing rhythm that will bring out all its tuneful colors.